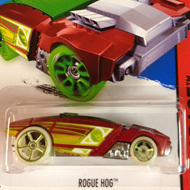 106/250 is part of the HW Off-Road series and the 2015 Treasure Hunt set. 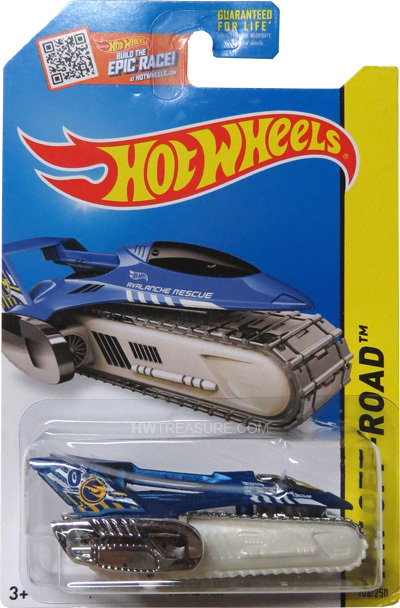 The blue vehicle features white graphics, “Avalanche Rescue”, and the Hot Wheels logo on each side by the canopy. The sides of the rear spoiler have white, black & yellow graphics as well as the low production symbol. It has a chrome canopy, Micro 5-Spoke wheels, and a white plastic Malaysia base with a chrome track. This unique car made its debut in the 2009 New Models series. It is a hybrid vehicle with the shape of a plane and a single caterpillar track for propulsion.